The Aggie Swim Camp is open on a first-come, first serve basis to any individual who satisfies the age, grade level, and/or gender requirements set forth in the registration materials. Male and female swimmers (ages 8-18) of any ability level are welcome to attend. It is highly recommended, but not required, that swimmers have competitive experience prior to attending. The Aggie Swim Camp is known as a premiere technique-based camp where our philosophy is “INDIVIDUAL ATTENTION". We do one-on-one analysis and detailed stroke work with EVERY camper, EVERY day. The Aggie Swim Camp is known for being the first major collegiate swim camp to send home an individual videotape of each camper, included in the cost of camp. This dvd is a great reference tool that you can use all year long. Extensive filming includes above water, below water, starts and turns with voice-over stroke instruction, as well as one-on-one video analysis with camp coaches daily. Also included on the dvd are demonstrations of stroke drills utilized by our coaches with their own teams throughout the year. Our coaches have a wealth of experience in coaching and developing age group to world-class swimmers including Olympians, Pan-American and NCAA champions. These coaches are on the deck working with the campers EVERY day. 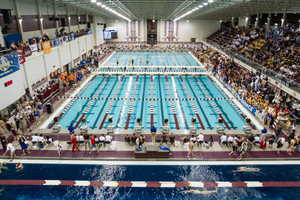 All pool sessions are held at the Texas A&M University Recreation Center Natatorium. The natatorium is recognized as one of the finest and fastest in the country and has recently undergone a massive renovation which was unveiled in September, 2014. The facility has been host to numerous collegiate, national and international level swimming meets, including the 2013 SEC Championships, women's NCAA Swimming and Diving Championships in both 2009 and 2004 and men's NCAA Swimming and Diving Championships in 2001, 1998 FINA World Cup and 1998 U.S. Open. At the 2001 Men’s NCAA Championships 25 NCAA, American and U.S. Open records were broken here. And in December of 1998 at the U.S. Open and World Cup Meets 67 records including American and World records fell. This spectacular $12.5 million state-of-the-art natatorium is our camp home. There are no lockers available at the TAMU Rec Center for campers to utilize while at the pool. Because of this we recommend that campers do not bring valuables to the pool facility. Backpacks and equipment are recommended to be brought onto the pool deck and left in the stands during all practices. Upon check-in all campers will receive a letter outlining their camp group and morning practice group. Our morning in-pool practices for sessions 1, 2 and 3 are conditioning practices and are divided into three groups based on ability - Maroon, White and Silver. (Ability is initially determined using the times submitted during the registration process. Campers will be moved around to a different practice group once camp starts based on performance during practices at the discretion of the coaches). During session 4 Technique Camp there will be no conditioning practice in the mornings and all in-water practices will focus on technique, drills and stroke enhancement. The natatorium will be set up in different ways, depending on which practice is taking place. Long course practice in the indoor 50 meter pool will be held during morning practices for our Maroon and White groups. Our Silver practice group will swim in either our indoor 8-lane 25 meter short course diving well or in our 6-lane 25 yard short course outdoor pool. All other practices will take place in the 50 meter indoor pool as short course 25 yards. While in the pool, our coach to swimmer ratio will depend on the practice group the swimmer is in, ranging from a ratio of approximately 1:5 in our silver group to a ratio of 1:10 in our maroon and white groups. Every camper receives 1:1 attention during our filming and review session every day. Outside of the pool our campers are placed in camp groups of approximately 15-20 campers according to age. These camp groups are supervised by a minimum of 2-3 adult counselors who are with the campers during all times outside of the pool. The main difference between sessions 1, 2, 3 and session 4 is that during our TECHNIQUE CAMPS and there is no morning conditioning practice. All of our in-water practices for session 4 are focused on drills, technique and stroke enhancement. Prior to the start of camp we provide round-trip ground transportation to and from the College Station airport at no charge. If your camper will be flying into College Station please be sure to let us know in advance by sending in the airport pickup request form with your completed camp forms. During camp all campers are transported to and from the dorms and practice facilities and activities via Texas A&M campus charter busses. (The dorms are approximately 2 miles from the Texas A&M practice facility and any activities). Campers are transported in their designated camp groups and are supervised at all times by their group counselors. Campers who drive themselves to/from camp are required to turn over their car keys to the Camp Director upon check-in for the duration of camp and are not allowed to drive for any reason during the camp session. The safety of your children is our top priority. Experienced and mature male and female coaches/counselors provide 24-hour supervision for all swimmers, including weekends for campers staying more than one session. Counselors live at the dorm facility on the same floors as the campers and are available 24 hours per day. All employees have passed a background check and extensive screening and training conducted by the Texas A&M University Human Resources Department prior to working with any campers. Roll calls are conducted by our counselors anytime campers move from a location or activity to ensure all campers are safely enjoying all aspects of camp. Our Camp Director as well as a certified athletic trainer also live in the dorms during all camps and are available to dispense medication and provide medical assistance when necessary 24 hours a day. Campers with specific medical needs are requested to talk with our athletic trainer during our camp check-in. Planned recreational activities are available daily during scheduled activity time from 12noon-1:30pm and after the evening stroke session. For multiple session campers, weekend activities are planned. Campers select their daily activity each morning before their first practice. Examples of our daytime activities include rock climbing at the Texas A&M Rec Center, shopping at the Texas A&M Memorial Student Center, recreational diving off of the 1 meter, 3 meter and/or 5 meter diving boards at the Texas A&M Rec Center, swimming at the outdoor splash pool and lazy river at the Texas A&M Rec Center, or relaxing at the dorms. Evening activities include movie night, a talent show, scavenger hunt, t-shirt designing, an ice cream social, and many more!! Check-in occurs AT THE DORMS on the first day of each camp from 2pm-4 pm. Campers will be able to unpack and remain with their parents in the dorm until our first roll-call at 4pm. Parents are welcome to stay at the dorms until campers leave the dorms for our first pool session at 5:15pm. Campers traveling by air should plan to arrive in College Station between 12 noon and 3 pm. All campers will check out and must be picked up AT THE DORMS by 11am for sessions 1, 2 and 3 and by 3pm for session 4 on the last day of each camp. Air departures should be made between 11am and 1pm for sessions 1, 2 and 3 and between 2pm and 4pm for session 4. Campers will be supervised until their departure. Check-in is on the first day of camp from 2pm-4pm at The Cambridge in College Station. During check-in your camper will receive a letter and nametag showing which camp group he/she is in, who the counselors for that group are, and where the group’s roll call meeting spot is. At 4pm your camper will go to his/her first roll call to meet the counselors and the rest of the camp group and will be given the rules and instructions for the week. Day campers will enjoy all the benefits of swim camp but will not stay overnight in the dorms. Day campers should be checked in with their counselor at The Cambridge café at 7:30am for breakfast each day. After breakfast day campers will do everything all other campers will do during the day. All meals will take place in The Cambridge café. Day campers will attend activities during the afternoon just as the resident campers do. During down time at the dorm day campers can enjoy time in the dorm’s game room, lobby, or in other campers’ rooms. Day campers should be picked up at the end of each day in the dorm lobby between 8pm-10pm before lights out. Day campers are invited to participate in all activities in the evening – the ice cream social, movie night, scavenger hunt, talent show or just hanging out in the game room or other campers’ rooms. Please feel free to discuss your day camper's schedule with his/her counselor during the first roll call on check-in day. Please do not pick up your camper unless he/she is checked out by a counselor. Parents of day campers are welcome to watch any practice at the TAMU Rec Center pool at any practice time in the upstairs spectator seating area. We do ask that you allow your camper to stay with camp as much as possible during the day, i.e. for meals, activities, etc. so your camper is able to enjoy the full camp experience. All campers will receive a Texas A&M Swim Camp t-shirt during their first camp roll-call. Additional Swim Camp merchandise will be available for sale during check-in and check-out. Merchandise includes items such as t-shirts, sweatshirts, shorts, caps, suits, blankets, etc. Camp photos are taken of the entire camp group on the first night of camp and are also available for purchase at check-in and check-out.